This downy woodpecker, about the size of a sparrow, was pecking away at a dead birch as I headed up Kilian Drive today. I caught her with my 40x digital zoom. I know she's a female, because a male of this species would have a red spot on the crown of his head, like a little crimson yarmulke. 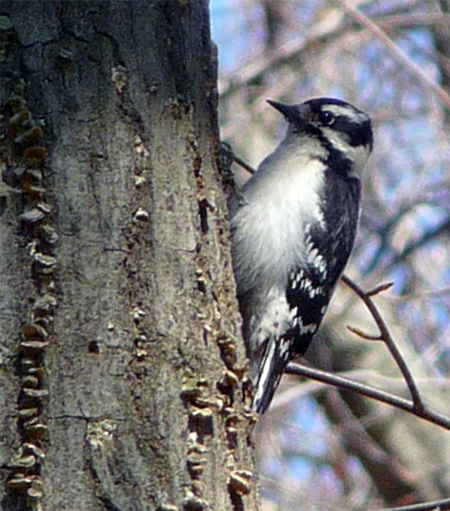 Downy woodpeckers are the most common woodpecker east of the Mississippi, and can be found all the way from Alaska to Florida. They drill holes in dead wood to find grubs and insects, but they also like berries and sunflower seeds. You may occasionally see them consorting with other species at your bird feeder. During mating seasons (one happens around this time of year), downies like to drum on resonant objects such as mailboxes and drainpipes. I've never observed this, but I imagine it makes quite a racket. Both male and female incubate the downy's eggs, but away from the nest there is a strict division of labor. Females look for food mostly lower in the forest, while males prefer the treetops. In fact, if a female strays too high in the canopy, her mate may shoo her to the bottom. I did some googling after taking this picture, and learned something I never knew before: A group of woodpeckers is not called a flock, but usually a gatling.